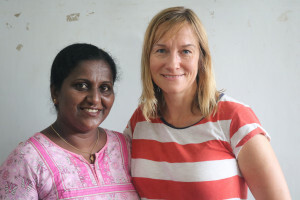 Much that has happened this week has caused us to reflect upon Pentecostalism in Sri Lanka. What follows is not meant to be prejorative but simply a way of processing thoughts as we go along. Yesterday we spent the day at the Baby clinic – once a week mothers come with their babies to the morning clinic (run by the formidable Poonash – see below) where they receive milk powder and food, health care and nutritional education plus spiritual support, if they desire. In the afternoon we helped out with the catch up school – the girls were taught how to make friendship bracelets and any who didn’t want to do that played games with John. These children are broken – John discovered that they didn’t even have the confidence to play games and , when the whole activity was sinking like a lead balloon, he finally offered colouring in farm animals in desperation and they leapt at the opportunity with joy! Today we went out with Poonash for her weekly health clinic. This involved visiting anyone in need connected with CC – originally CC only worked with the ‘village’ on the beach but after the Tsunami many were relocated to various parts of the city. Poonash simply visits them in their homes and offers physical and spiritual care. Today’s visits included a girl terrified by demonic oppression, a woman with a crippled foot from diabetes, triplets who had been abandoned by their father, and a grandmother attacked by her son. In my last post I commented how well CC intergrates the physical with the spiritual. This seems to stem from a pentecostal theology of ministry. Most of the Christians involved in CC express a pentecostal worldview. Much more than in the UK the impression we receive is that (with some wonderful exceptions) the mainline church is seen as traditional and dying, whereas the pentecostal church is growing fast. Last night John and Emily went to the ‘Miracle Hour’ of Pastor Jerome’s Kings Revival Church in Colombo. The meeting was held in the SL Exhibition & Convention centre because it was the only building they could hire to seat the 3000 people who came. The speaker was Pastor Dill, the founder of Kings Revival Church, and was a four hour healing service! This theology runs through all that CC does. The drug rehab ‘Power House’ mostly adopts Jackie Pullinger’s methodology from Hong Kong – i.e. When the addicts first join the programme they are ‘prayed off’ the drugs for 10 days with no other medical support or intervention. 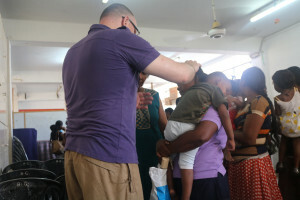 Similarly most of the programmes we have been involved in people are offered prayer ministry – John has had to pray for healing, exorcism, for alcoholic husbands … And so on. The confidence in Jesus is amazing! Overall we are so impressed by CC – there is much to think about in our own lives. The thing that impresses John the most is the way the CC workers see their faith applying to the whole of life. They never force their beliefs on anyone but it comes out all the time because it is so important to them. We covet the way they offer to pray for people at the drop of a hat – because it is the most natural thing in the world. There is no doubt that Sri Lankans are much more aware of the supernatural than most Brits. They are quick to blame things on evil spirits and try to ward them off with charms. It is challenging to be reminded of these spiritual realities on a daily basis. However, it is also easy to see why pentecostalism would be popular in a society like this – there is no doubt that many people view our offers of prayer just like the charms that they may try elsewhere. Ummh, much to process and also to think about when we return to the UK. Great to read this update. I am especially pleased that you are developing your cross cultural skills in children’s ministry!!! Very thought-provoking observations especially after I attended a challenging Global Connections Healthcare Forum on Tuesday showing the strong connections worldwide between healthcare ministry and evangelism. More food for thought….